The world's first and only all-surface interior vehicle protection! Ultima Interior Guard Plus uses superior science and technology to coat, seal, and protect every finish in your fine vehicle. This clear sealant dries completely and will not leave a greasy, slippery film that attracts dust. Instead, fabrics, leather, and vinyl will all take on the tactile feel of fine cashmere. A damp cloth is all that is required to clean and maintain your interior as sealant protection lasts for months. Surfaces to be treated must be clean and dry before treatment. On all leather, vinyl, plastic, and wood trim surfaces, mist 1 or 2 shots of Ultima Interior Guard Plus onto the soft 'applicator' sided of the Ultima Interior Sponge and wipe on the finish. Work in well and apply evenly. Allow to dry for 3-5 minutes, then buff with a clean, dry microfiber towel. On cloth, mist the surface and work in thoroughly with the Ultima Interior Sponge. Allow to dry one hour before use. Note: Surfaces to be treated must be clean and dry before treatment. Allow to dry one hour before use. 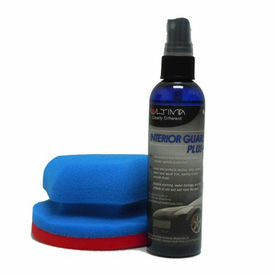 Ultima Interior Guard Plus, 4 oz. Ultima Interior Handy Grip Applicator, 5" by 2.5"
The world's first and only all-surface interior vehicle protection! Ultima Interior Guard Plus uses superior science and technology to coat, seal, and protect every finish in your fine vehicle. This clear sealant dries completely and will not leave a greasy, slippery film that attracts dust. Instead, fabrics, leather, and vinyl will all take on the tactile feel of fine cashmere. A damp cloth is all that is required to clean and maintain your interior as sealant protection lasts for months. Key Benefits Boosted by Polycharger'; for superior protection Seals and protects leather, vinyl, plastic, and wood trim Resists staining, water damage & the effects of oils and salt from the skin Provides UV protection to prevent drying and cracking of interior surfaces Instructions Surfaces to be treated must be clean and dry before treatment. On all leather, vinyl, plastic, and wood trim surfaces, mist 1 or 2 shots of Ultima Interior Guard Plus onto the soft 'applicator' sided of the Ultima Interior Sponge and wipe on the finish. Work in well and apply evenly. Allow to dry for 3-5 minutes, then buff with a clean, dry microfiber towel. On cloth, mist the surface and work in thoroughly with the Ultima Interior Sponge. Allow to dry one hour before use. Note: Surfaces to be treated must be clean and dry before treatment. Allow to dry one hour before use. Recommended Surfaces Leather interior surfaces Vinyl interior surfaces Plastic interior surfaces Wood trim interior surfaces Cloth interior surfaces Contents Ultima Interior Guard Plus, 4 oz. Ultima Interior Handy Grip Applicator, 5" by 2.5"